Am important intervention was made by Dr. Viroj Sumyai, President of the International Narcotics Control Board, at the fifth intersessional meeting of the sixty-second session of the Commission on Narcotic Drugs on 7 November 2018, which focused on the implementation of the UN drug control treaties. The discussions had been dominated by states’ anxieties concerning the decision of Canada to legalise and regulate the consumption of cannabis. 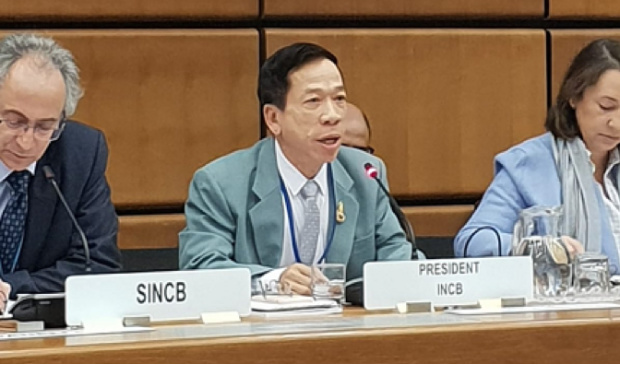 Dr Sumyai’s presentation marked the 50thanniversary of the establishment of the INCB, and was entitled ‘Fostering a united approach to the effective implementation of the three international drug control conventions’. He began by noting that ‘The fundamental goal of the UN drug control conventions is to safeguard the health and welfare of humankind by ensuring the availability of narcotic drugs and psychotropic substances for medical and scientific purposes while preventing their diversion and abuse’. This formulation reverses customary descriptions of the goal of the conventions, which often includes the availability of drugs and medicines almost as an afterthought. He argued that the problems of contemporary drug control around access to medicines derive not from the conventions themselves but from states’ domestic policies and legislation. This has led to deficiencies in the availability of medicines, overly punitive measures and overincarceration, stigmatisation and marginalisation of people who use drugs, and the violation of human rights. Dr Sumyai continued, stating that ‘Governments urgently need to address capacity and resource constraints in the health care field, which includes increasing availability and the know-how of health-care professionals (doctors, nurses, pharmacists and regulators).’ The lack of healthcare services and resources was identified by the President as the key area resulting in a lack of access to controlled medicines. Dr Sumyai then addressed the problem of extrajudicial killings of suspected drug offenders.Speaking in the following terms: ‘extrajudicial responses to drug-related criminality can never be justified under the international drug control conventions, which require that drug-related crime be addressed through formal criminal justice responses, an approach consistent with the Universal Declaration of Human Rights and the International Covenant on Civil and Political Rights, which require adherence to internationally-recognized due process standards’. He also said that the Board, in harmony with the norms of the rest of the UN family, would ‘encourage all States that retain the death penalty for drug-related offences to commute death sentences that have already been handed down and to consider the abolition of the death penalty for drug related offences’. The INCB’s intervention was an overwhelmingly positive one, and was especially welcome in the context of the intersessional meeting in general.